StockCockpit.com proudly present the first free MACD Signal multi timeframe screener. The Screener list statuses of Nasdaq100 MACD Signals in Day, Weekly and monthly timeframes in the same view. Why is this list important ? Because we often find a Stock that is in Uptrend on the Daily Chart and then we buy it. Then the Stock begins to fall, because we did not realise that the Stock actually were in longtime Downtrend. This type of Trades often results in losses. To prevent this, we have invented this list of Nasdaq100 MACD Signals. Now you can get an overview of the trends for all three timeframes, so you dont buy against the longterm trend. The most profitable would be, if you find a stock on the list with the lowest Day and weekly timeframe. This way you hit the Stock from the beginning of the Trend. 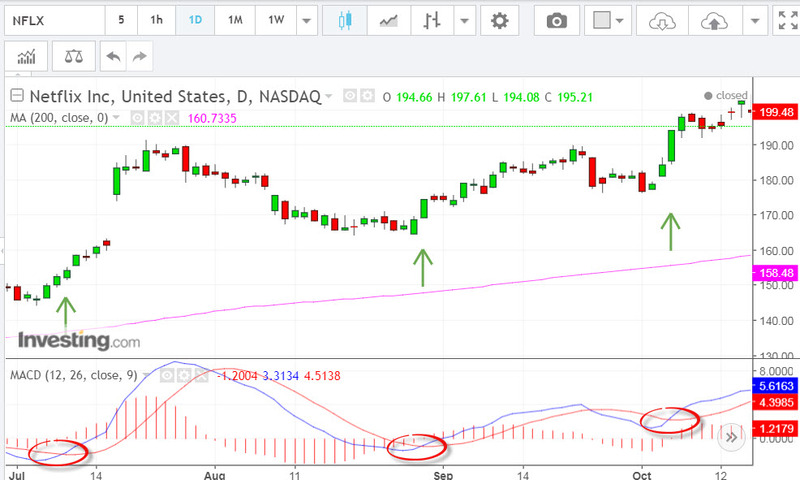 It is no good to hit the Stock at the end of the trend, just before it change direction. See example below the list. Sample of how to hit the price at the right time.